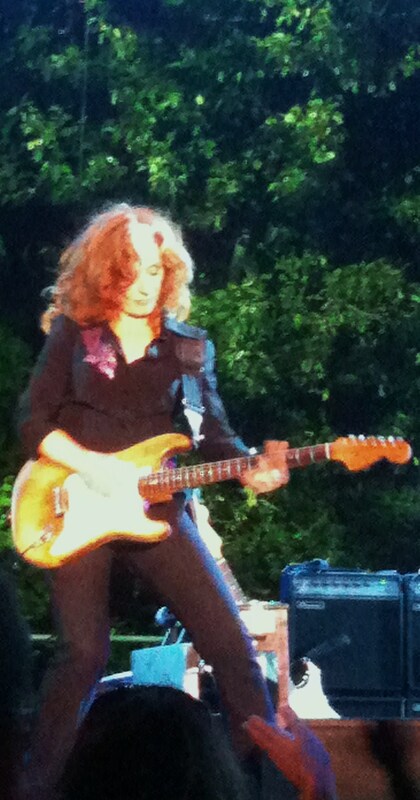 I recently was gifted with a ticket to a Bonnie Raitt concert. It came from one of my closest friends, who has treated me a few times over the years for no reason in particular that I can tell, except that I am lucky to be her friend. We always have nearly front row seats. This venue was Edgefield, just outside of Portland, so we enjoyed the embrace of sky and sun, with gusty winds out of the Columbia Gorge to enhance our experience. The moon showed up bold and bright halfway through and cast a benevolent glow. We didn’t need anything else to improve our mood, although lots of people were enjoying beer and wine, and smoking pot only a bit surreptitiously. Likely a lot of other substances were involved, from the looks of the exuberant women and keen-eyed men. My friend and I haven’t had a drink or drug in over twenty years. We had long ago partied our way in and out of concert halls and music festivals and only remembered about half of them. So we were missing out on nothing this night. What we had tickets for was the promise of inspiration, joyful sass and a low down bluesy melancholy that only Bonnie Raitt can do the way she does, with her slide guitar finesse and her panoramic voice. When she lets loose an edgey crescendo, you stand up and cheer. When she lifts a tender note from the bitter depths, you weep or nearly so. As love moves into the limelight the cadence of desire builds longing. And when she struts across the stage, shakes that mane of red hair and teases the audience with a still-smoldering playfulness, you realize how long and winding a road it has been for her, and for you. Her songs have likely chronicled many lives–hers, the other songwriters’, and ours. Mine, for certain. Her music has carried me and cleared my vision; it has offered me relief. When things failed, Bonnie’s music undid the ruin for at least a few moments. She wound me up and let me down easy and it was all because she sang what mattered most. I remember first listening to her in the mid-seventies. I would have sought her out sooner but I was a late bloomer. I had been trained in and raised on classical music, so when I decided to act up and venture into the musical hinterlands, I fiercely attached myself to Joni Mitchell, Joan Baez, Bob Dylan, Judy Collins and Gordon Lightfoot to name a few, with a smattering of Moody Blues, Cream and Chicago thrown in. My older sister, living in Washington after a few years in exotic California, exposed me to a new variety of musicians, and Bonnie Raitt was one. Despite having bought a couple of earlier albums, Bonnie’s songs are actually cemented in my memory druing the year 1979. I had come to the conclusion my first marriage was ending, despite hanging on to the last shred of hope. There seemed so little I could do to make sense of it. But I was a writer and writing it out was what I did whenever the kids were in bed, after the sun vanished. I would listen to the deer snuffling outside, eating our beautiful corn, drink wine and write poetry that illuminated too little. And I played music softly, hoping for a small miracle of one sort or another. 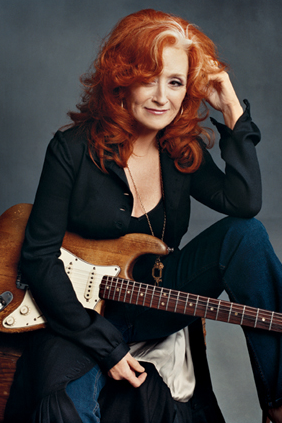 Bonnie Raitt’s music helped me find the strength to grieve and move on. I played her albums The Glow and Sweet Forgiveness over and over that year. They got me through along with Bach cello suites (some of which I attempted to play on my beloved cello), and a few other treasures. She probably sings about love the best, all the varieties, whether it triumphs or crashes and burns. And for me that is a good thing, as although I am as fascinated by love as anyone else, it has been a confounding part of my life, full of flash and bite, heat and shadows, and the long still points of no return. If there is one thing I have tried to write about and felt I have missed the mark too often, it is the mystery and mastery of love. But not Bonnie Raitt or her fabulous songwriters. Just play “Love Sneakin’ Up On You”, “I Can’t Make You Love Me” and “Wherever You May Be.” The list gets very long. I have heard them all by now, many times. But the September concert with my dear friend is one that will stay with me. We have shared a lot over the years, including a love for this music. And, like Bonnie, I think, we are both fighters who have learned when to stand up and when to step away; we have found some peace. When dancing rises up in our bones and blood it may be with a sigh as well as a shout these days. We have done and witnessed some things hard to forget, had our lives hijacked and taken them back. We’ve found happiness easier to create than to wait for, and we laugh a lot. So, we sit up–or stand–close at Bonnie Raitt’s concerts and hear about risking it all for love but not the loss of our souls. Being revolutionary in our everyday lives by having mercy and not giving up, by being fully present and accountable. Finding the silver inside the blues. And having fun for no good reason. So I hang out with Bonnie just as much as I used in my twenties. She sings my tunes. And I still sing her songs in moments of solitude. And when the music comes–it roars awake as it always did, after all these years–I feel right at home again. So, thanks, Bonnie. I’ll be up front whenever you come to town again. wonderful description! i love bonnie, too.